BirdFBrain, by Matt Mauch. Trio House Press, January 2017. 138 pages. $16.00, paper. In the first lines of Matt Mauch’s third collection of poems, titled Bird∼Brain, he compares a songbird to “an estate sale ad/ packed with so many implausibly well-kept/ treasures”. The same could also be said for the poems in this book, which are packed to the brim with imagination, and dazzling in their linguistic and syntactic command. 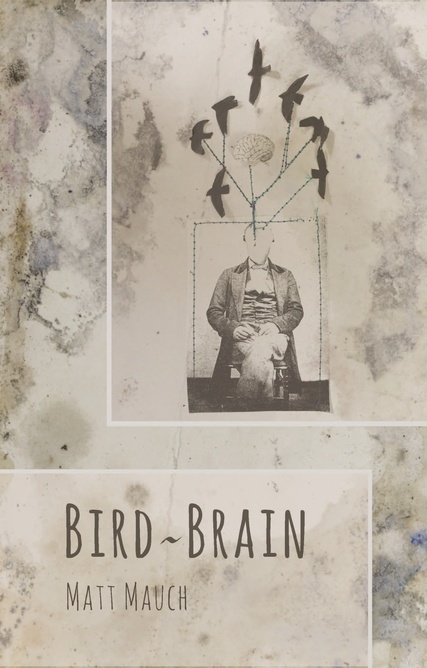 Bird∼Brain is frequently clever, but never crosses over into disingenuousness; rather, it is a book that soars with energy and lands with emotional precision. in the light moon wind. What I love about most about Mauch’s work are moments like this. Here we see a sprawling, labyrinthine sentence which opens by animating a single leaf and takes the reader on a voyage which extends beyond the life of the leaf, beyond our atmosphere, and into space. That there is also a self-awareness about the anthropomorphization of the leaf shows us another voyage—the speaker’s constant search for truth and emotional honesty. I hope you have neither. The snow melted inside and out. We were beginning to stumble over the corpses winter leaves behind. We lifted shades, opened windows, waited for the light to pasteurize. (that were able to) rose and crashed like birds in a hurry to migrate. Mauch’s poems are striking in their level of activity and immediacy. These particular excerpts illustrate the life-or-death urgency of mortal beings, but notably, there’s an absence of fear. In these passages, death and beauty occupy the same spaces, which forces us to collapse and redefine our emotional boundaries. These poems are not interested in lamenting the futility of life with the inevitability of death; instead, these poems celebrate the world in front of us and all of its damaged imperfections. Responsibilities (bird- and human-related) aside, I should also emphasize how much joy is found in this book. Make no mistake: these poems are thrilling to read. The titles, as you have probably noticed, are extensive and function as micro-poems in their own right, some of them even containing line breaks. Titles such as “The true story of how I learned that the graveyard shift meets at Prince’s for drinks at 6:30 a.m.” and “The clog I can’t get unclogged,/ which I’ll probably never tell you about/ (the drinking on company time that I will)” carry force and charisma, obviously, but most importantly, they break down the walls of where poetry has been allowed to live. With Bird∼Brain, Mauch argues poetry should live everywhere, and does if we are simply willing to look hard enough. Lucas Pingel is an assistant professor at St. Catherine University in Minneapolis, Minnesota, where he has been the recipient of the Denny Prize for Excellence in Writing. He has authored three chapbooks of poetry, most recently Yes, This Was a Beautiful Place, a collaboration with BJ Love.